How to use LinkedIn effectively is a question most people have asked me during interactions. LinkedIn is the most important among social networking sites from professional perspective. I would recommend using & optimizing LinkedIn effectively to increase your Career & Business Growth Opportunities. 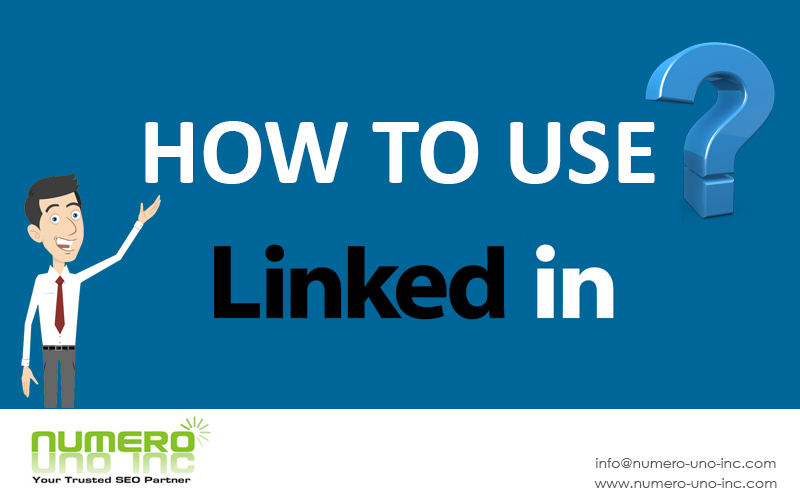 How to use LinkedIn effectively is a question most people have asked me during interactions. Having a complete LinkedIn profile considerably increases your visibility in LinkedIn search results. Most importantly this site has a percentage tracker to let you know how complete is your profile. Add proper Description highlighting your journey, key achievement & strengths. Keep it crisp though, so as the visitor gets a gist about work details. Mostly for details he shall scroll further. Most important, detail the jobs you have done with designation & timelines in this section. It will help the visitor understand your background, designation, profile, location, company etc. Although ex-Colleagues would be more than happy to connect here & engage too. Kindly put a pic with professional look in a suit & not some holiday pic,this is the most crucial point to remember. It is always better to put a face to a name, though you can relate more. Do share your contact information so that your connections can reach you. Share your not so private contact details like blog, twitter handle etc. as they are displayed to people who are not connected to you too. Note that letting people know your education adds credibility to your profile. Add all your existing clients by finding them on LinkedIn search. You will be able to interact with them more & also would be able to generate some more business. Add your old clients too, as this will become another medium to engage with them more. Vendors are your partners & adding them here helps to increase connectivity. Some connection of your vendors could be your potential clients or vendor too. Your associates in your business are to be added on LinkedIn without fail. Associates help you generate visibility & more business too. Add all your possible colleagues (old as well as existing) to your LinkedIn connections list. They will be happy to find you here too. Many of them of will surely endorse you & recommend too. This will surely add weight to you LinkedIn profile. Colleagues help you in finding some assignments or new job too. Prospects are your potential clients. Adding them here & engaging them will surely increase your chances of converting them to customers. This is one of the most widely used feature of LinkedIn. As & when you add a connection, LinkedIn prompts you to endorse them. You should give genuine endorsements according to the skill you feel they possess. Recommendation should also be given to deserving connections according to work you have been associated with. You can ask for recommendations in return too. LinkedIn has many groups & you should join a group suiting your business interests. Engage in the groups with other members & may be you will find a potential client or partner. Post relevant content to the group which will be useful to fellow members too. Continuous & irrelevant posting can get you into trouble too. Group admins can withdraw your membership to the group. Engaging is most important on LinkedIn. Most imporantly this site lets you know the birthdays of all connections in the notification section. You can use the standard greeting message available to wish. Customize the Greeting for better results. Similar to birthday, LinkedIn lets you know the work anniversaries of all connections in the notification section. You can use the standard greeting message available to wish. Personalise the Greeting for better results though. In notification you will also be able to see the new positions your connections have taken as they update their profile. Congratulate them & if possible personalise the message. Note that you can message all your connections. Although use this effectively to engage connections effectively for business or career growth prospects. 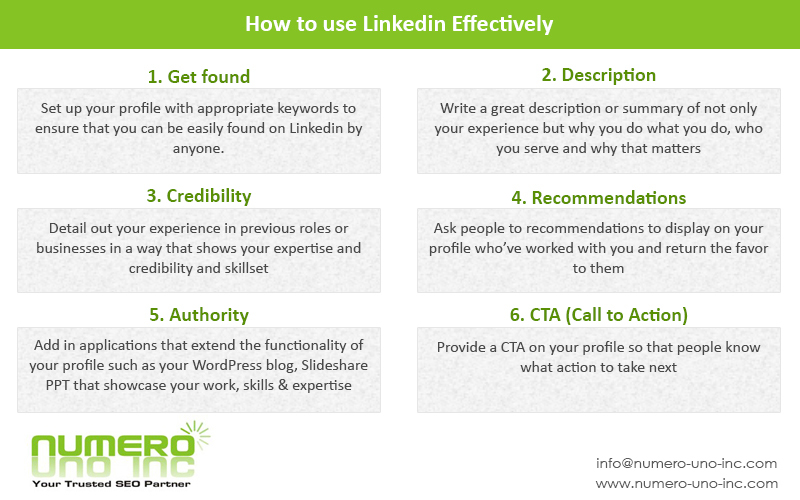 These are the basics on how to use LinkedIn Effectively. I would recommend that you spent mostly about 15-30 minutes on a daily basis to see the results. Nevertheless,you can also use it from your mobile & travel time can be best utilized in this manner. Please share & like the article if you have liked. Please note- We also manage Linkedin Profiles for CXOs, to know more connect with me personally. This entry was posted in LinkedIn, Social Media Marketing and tagged How to use LinkedIn effectively, linkedin, linkedin steps. Bookmark the permalink.